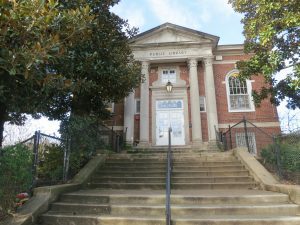 The Southeast Branch Library has been a valued institution since it opened in 1922, and in particular, has enhanced the education of generations of Capitol Hill children. CHRS believes that the planned renovation is a good occasion to study and appreciate the library, which as it turns out, is one of only a handful of libraries in the city funded by Andrew Carnegie, has a direct connection to one of the most famous libraries in the country, and is a great example of the Classical Revival style, designed by an eminent architect. The Capitol Hill Restoration Society has filed a nomination for it to have a Historic Landmark designation. In 1887 the trustees of the Boston Public Library wanted their new library to be “a palace for the people.” The famous architecture firm McKim, Mead and White studied Classical and Renaissance palaces and created a true library palace. Renaissance Italian palaces had ample windows on street floor where rich merchants conducted business, and on the more important second floor, where the family lived, much larger and rounded windows with taller ceilings, the piano nobile. The Boston Public Library’s piano nobile contains the reading rooms for the public, with large rounded windows and beautiful natural light, the best part of the “palace.” The Boston Public Library is one of the most famous libraries in the country. 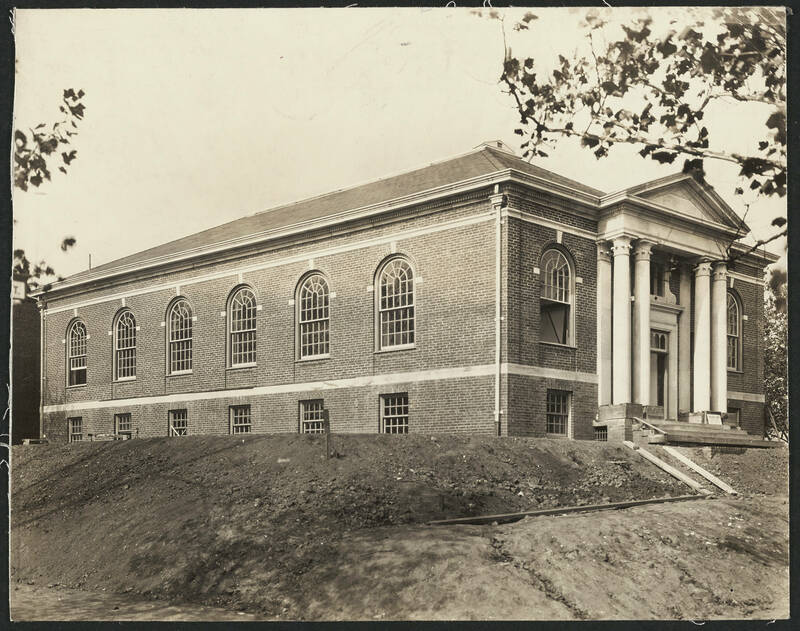 Our Southeast Branch Library, built in 1922, has a direct connection to the Boston Public Library — Edward L. Tilton, who designed the Southeast Branch Library, worked at McKim, Mead and White when the firm was designing the Boston Public Library. He mastered the Classical Revival style and became a noted expert on library design. Thanks to Tilton, our library has a direct connection to the Boston Public Library: a Renaissance Palace — reading rooms with large rounded arch windows on the piano nobile, and the entrance is the entrance to a Roman temple. In 1886, Andrew Carnegie began his charitable work of funding libraries across the county. He would pay to construct the building if the municipality provided the land and funding for operations. 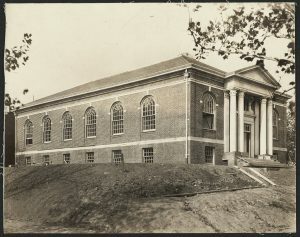 In 1921, Congress appropriated funds to buy the land for the Southeast Branch Library. 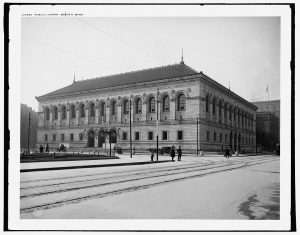 Carnegie paid for 1,681 libraries, including four in DC: Main library at Mt. Vernon Square (1903), and three branch libraries: Takoma Park (1911), Southeast (1922) and Mount Pleasant (1925). From the beginning children’s education was a key part of the design and operation of our library. The children’s reading room, a Boston Public Library innovation, was built as part of the library’s original plan, near a welcoming and homey fireplace to hold story hour. The library has always had children’s’ librarians and special programs for children. 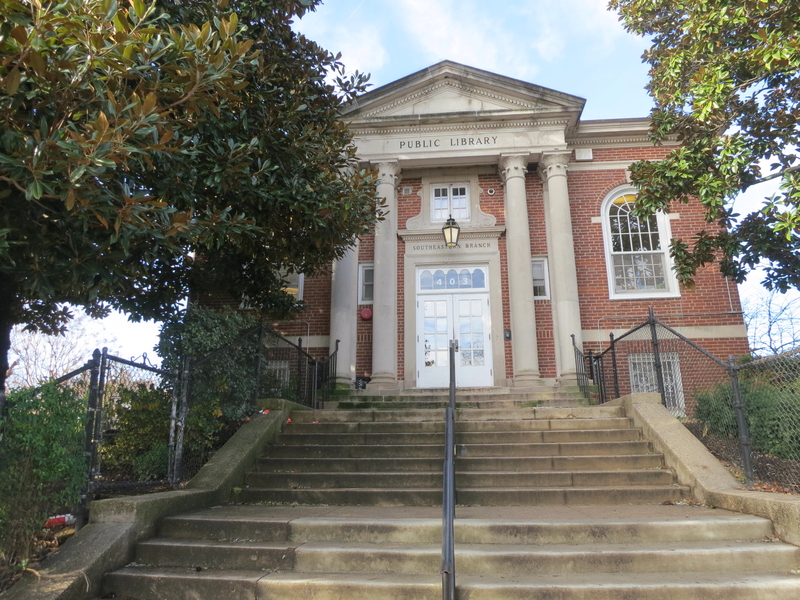 The Southeast Branch Library has been slated for renovation, and the DC Public Library has begun the process by holding a community meeting. Adding the Southeast Branch Library to the list of historic landmarks does not alter, or add to, the review process for any changes to the exterior of the library. Because the library is a contributing building in the Capitol Hill Historic District, the Historic Preservation Review Board (HPRB) will review any proposed changes to the library’s exterior, and because this is a DC government project, the DC Historic Preservation Office (HPO) will also review any proposed changes. HPRB and HPO reviewed the renovation of the Northeast Library in 2012. HPA 12-303. The review of renovations to the Southeast Branch Library will be done in the same way as the Northeast Library, which is not a landmark. This nomination adds to our knowledge and appreciation of the building. *** Photographer unknown. District of Columbia Public Library (1922). dcpl_archives_0138 tif.